Army Division to Afghanistan – hoax or perception building? Word by word Identical reports from Washington, Afghanistan, Pakistan and India are talking about India planning to send 15,000 troops to Afghanistan – as is a press release has been issued by someone. These reports also refer to deliberations at a "close-door round table at the Woodrow Wilson International Centre for Scholars, as if the Woodrow Wilson International Centre hold press briefs after close-door discussions. The report further talks of a veteran Indian military scholar having "visited Washington DC and tried to convince President Donald Trump Administration to allocate India an official role in Afghanistan". Wonder if this leak is inspired by Washington and picked up by Pakistan and India, or is it inspired by Pakistan for testing possibilities and picked up by Washington who have been wanting Indian troops deployment in Afghanistan past several years, and later picked up by Indian media. Moreover, India doesn't need a veteran military scholar to convince the Trump Administration (or any other nation) to allocate India an official role in Afghanistan or anywhere else. Both India and Afghanistan are sovereign nations and are joint signatories to the India Afghanistan Strategic Partnership Agreement 2011. The above report quoting un-named diplomatic sources state: Ajit Doval, Indian NSA plans to rush to Afghanistan to cash on the latest wave of terrorist attacks and make an official offer of sending Indian troops to defend Afghan Government leaders; Doval recently met his Afghan counterpart asking Afghan government to officially ask the Indian Government for Indian troops; on May 28, 2017, just two day before the recent Kabul attack, Afghan Pajhwok news agency dispatch from Washington reported India could send troops to Afghanistan under "UN mission"; and the Pajhwok dispatch published in 'Outlook Afghanistan' quoted a "prominent Indian defence expert" told a Washington audience on May 18, 2017 that "New Delhi could perhaps be persuaded to send up to a division of Indian troops (around 15,000) to Afghanistan under United Nations Peacekeeping mission." Technically, India can position troops anywhere in the world with concurrence of the host country, like IPKF to Sri Lanka under the Indo-Sri Lanka accord. India and Afghanistan have a Strategic Partnership Agreement which included which includes security cooperation, but it is not a defence pact. To say that Afghan Government would make such request to protect its "leaders" is derogatory, implying Afghan National Security Forces cannot protect Afghan Government leaders. There is also the issue of costs for maintaining such force in Afghanistan because Pakistan will unlikely allow over-flights in such case. Of course India can position troops anywhere if it serves its national interests, irrespective of costs. But question also remains what would be the task of such a force? 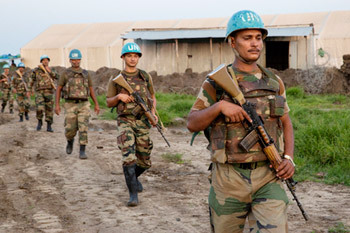 If placement of a UN Force in Afghanistan was possible, the US would have ensured so years back, but UN Force deployment is contingent upon two warring sides agreeing. In this case Afghanistan is at the receiving end but Pakistan continues to maintain it has no role in terror attacks in Afghanistan, and on the contrary she portrays herself victim of terror. While the media reports in question are misleading, such decisions would obviously be taken jointly between India and Afghanistan. At th same time, Afghanistan needs an effective Industrial Security Force that would facilitate mining the trillion dollar plus minerals to bring up its economy. India should help Afghanistan in establishing such force in addition to the military assistance that is being rendered. But most important is countering the proxy war that Pakistan is waging on India, Afghanistan and Iran. Major General Mohammad Baqeri, Chief of Iranian Armed Forces, recently warned Pakistan it will hit terrorist sanctuaries inside Pakistan if it does not confront terrorists that are carrying out cross-border raids. According to General Baqeri, the border area on the Pakistani side has turned into a haven and training ground for "Saudi-hired terrorists, who enjoy the US endorsement". Logically, India, Afghanistan and Iran would have already been discussing Pakistan's terrorist menace. But with Pakistan exporting more and more terror aggressively, time is more than ripe for the three nations to respond to Pakistan in concerted and synchronized manner at the hybrid plane.